Greenkeeper Lodge liegt im ruhigen, schattigen Vorort von Lakeside & überblickt das 13. Loch des West Lake Golfclubs mit den spektakulären Bergen im Hintergrund. Der hoch bewertete Golfplatz & der herzliche Empfang, der den Besuchern geboten wird, schaffen ein Paradies für jeden Golfer! Wir bieten eine geräumige Selbstversorgungs-Ferienwohnung im ersten Stock des Haupthauses mit privatem Zugang, sicherem Parkplatz und Platz für 2 Gäste. Ein privater Balkon & ein Salzwasser-Swimmingpool bieten perfekte Entspannung sowie ein Sonnenbad. Greenkeeper Lodge befindet sich nahe an den Badestränden von False Bay sowie dem angrenzenden Tafelberg-Reservat & hat auch Verbindungen zu den großen Attraktionen der Stadt (25 Min). 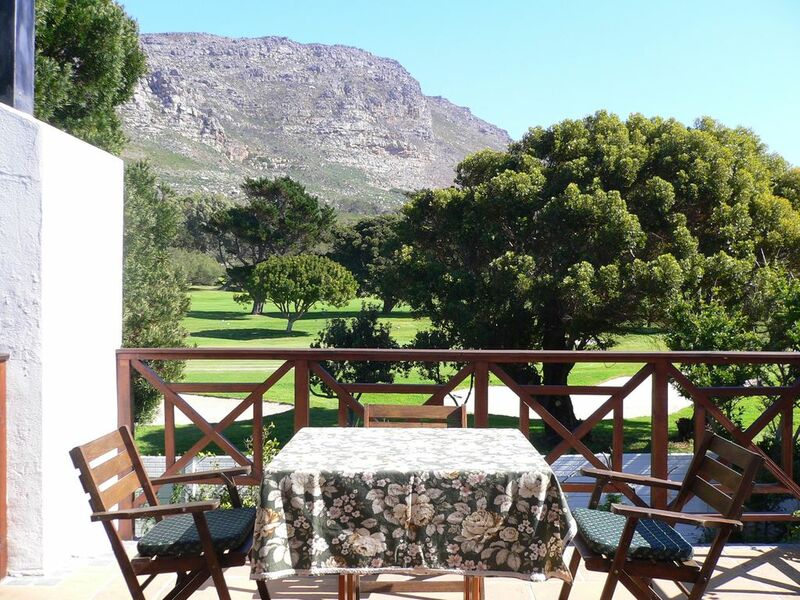 Von der Lodge aus sind die Golfplätze von Clovelly & Steenberg sowie die Weistraße des Constantia-Tals leicht erreichbar. Diese Attraktionen & viele hervorragende Restaurants in der Nachbarschaft machen Greenkeeper Lodge zu einem perfekten Ort für einen Urlaub in Kapstadt. Pleasant apartment with a nice view. This is a pleasant apartment, which was clean, very comfortable and well equipped. There is a nice view of the golf course (if you're not an early riser then the lawn mower on the golf course at 6.30 in the morning might be a problem). It is very well situated for getting into the centre of Cape Town within 15-20 mins. Sadly there was a negative side to our stay. The apartment hadn't been used for sometime before our stay. Due to there having been a water shortage the toilet cistern had been turned off and the stagnant water left in it gave off a very unpleasant smell which pervaded the apartment for the first couple of days of our stay there. With no running water to the cistern we were supplied with buckets of water. Once we drew this unpleasantness to our hosts attention they turned on the water supply to the cistern and disinfected the toilet. It's a shame this spoilt an otherwise good stay. We are so pleased that you found our apartment comfortable and that you enjoyed the lovely view and its favourable position. However, we were very upset that you encountered an unanticipated problem with the water flow. The water supply to the cistern was never turned off, nor turned on again. We can only surmise that, with the long period that the pipes lay empty during the drought when only grey water was used to flush toilets, this led to the pipes not being filled to normal flowing capacity for a day or two. The buckets of wellpoint water were provided as optional means to assist with water saving. It is most regrettable that the first two days of your stay were affected in this way and we are very apologetic. However, we hope that you take with you some very good memories as well! Reservations were uncomplicated and inquiries dealt with promptly. Steep flight of stairs, so not suitable for persons with mobility challenges. Lovely, spacious, light apartment. Beautiful view with the mountain and golf course as a back drop. However, light sleepers may be woken up by early golfers and lawn mowers. Easily accessible to major freeway and beaches. A pleasant retreat. We have stayed at Greenkeeper Lodge several times and always look forward to returning to this delightful, tranquil spot. The apartment forms the entire top floor of the owner's house, and they are delightful, welcoming and extremely helpful. Everything is kept wonderfully clean by. Sweetness, the maid, who comes in twice a week. Good shopping facilities and restaurants are close by, and one is well placed for visiting anything in the Cape. Security is good, with an alarm system and your car is parked behind an electric gate. The accommodation is very comfortable, with large airy double bedroom with plenty of hanging space, and a spacious adjoining bathroom with a huge tub and separate shower. The living room is integral with the kitchenette. Both are well-equipped and comfortable for two people. This area extends out onto a good-sized balcony for outside eating. The whole flat overlooks Westlake Golf Club with the backdrop of the glorious mountains. One can never tire of this exceptional view. There is the added bonus of a pool in the garden should you feel the need for a dip. This is shared with the owners. I cannot rate this apartment highly enough, hence the reason for our return visits. Greenkeeper Lodge is a wonderful place to stay. The location couldn't be better: it's in a quiet residential street only a couple of minutes' drive from the N2, which gets you into the suburbs of Cape Town within 10-15 minutes. There's easy access to lovely seaside towns like Kalk Bay, and there are shops and restaurants within walking distance, including a decent pub and a lovely Italian. Your two balconies look out over the golf course and dramatic mountain scenery. But the real appeal of this accommodation, where we spent 11 wonderful days, is the comfort. Heather and Bruce make you so welcome, providing fruit, fresh flowers and a bottle of wine: they even did some shopping for basics as we were arriving late on a Saturday. You have total privacy and yet easy communication with your hosts by telephone provided in the apartment. It's a real home-from-home: the bathroom and bedroom are spacious and quite luxurious. The quality of the furnishings and fabrics is lovely, and the bed was the most comfortable one we've ever had in any holiday accommodation. There are all sorts of thoughtful touches, including toiletries and kitchen basics such as teabags, oils, even rubber gloves! We had a few nights in, sitting on the big balcony watching the sun go down, cooking, drinking the delightful local wines and star-spotting. There's a barbecue which Bruce kindly brought up to the balcony for our use, and the swimming pool is idyllic, with sun-loungers and a shady bower for those delicate complexions! All in all, we had a completely fabulous holiday, thanks in no small part to our great luck in booking Greenkeeper Lodge! We stayed at Greenkeeper Lodge for the first 5 nights of our first visit to South Africa. It was a lovely introduction to Cape Town. We could not have been more comfortable and Mr & Mrs Powers were extremely helpful and welcoming. The apartment is beautiful equipped and we were very appreciative of touches such as a bowl of fruit and basics such as tea, coffee etc. We found the location perfect for all the sightseeing we wanted to do. I would thoroughly recommend Greenkeeper Lodge. Lovely view with country feeling and lots of visiting birds and squirrels. Lots of very pleasant walks in the area and a great little Italian restaurant just down the road. Two Malls within 5 minutes drive for the shopaholics and the sea and beaches also within 10 minutes drive. A stones throw from the Constantia wine route and easy access to the main highways to explore the Peninsula and the interior. All in all a great base to stay and operate from when visiting the Western Cape and i would most certainly recomend this property to my relations and friends. The owners are a lovely couple and are most approachable when help or guidance is required. Lakeside befindet sich im Herzen der Kap-Halbinsel, in der Mitte (30 Minuten) zwischen dem Flughafen Kapstadt, V&A Waterfront, Cape Point und Simonstown (Pinguine). Die Berge der Halbinsel, die Weinstraße Constantia, Golfplätze, Strände, der See und der Jachthafen liegen praktisch vor Ihrer Haustür. Golf: Der Westlake Golfclub schmiegt sich an die Silvermine Mountains und überblickt den Südteil der Halbinsel sowie die False Bay. Dieser Golfplatz mit Meisterschafts-Standard war vor kurzem Austragungsort der südafrikanischen Amateur-Meisterschaften. Rates are quoted per night for the apartment. Rates are subject to change until reservation is confirmed. A 50% deposit is required to confirm the reservation with the balance payable before or on arrival. Payment is by bank transfer or by credit card. Rates are negotiable. Our cancellation policy is available on request.